The Proust Questionnaire, popularized by the French essayist and novelist Marcel Proust, is said to reveal a person’s true nature through a series of probing, soul-searching questions. 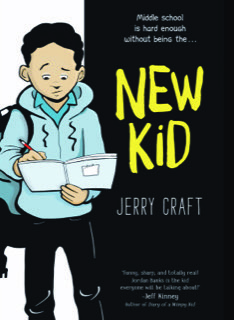 In the hot seat today: Jerry Craft, author/illustrator of the graphic novel, NEW KID (HarperCollins, February 5, 2019). What is your idea of perfect happiness? A well-balanced life. I always start with my family, and making sure that my sons have memories that they will fondly look back on when they’re older. Next is working on new books for kids. Even though writing and drawing New Kid was a LOOOOOOOTTTTTTTT of work, it was an amazing experience, and I look forward to doing this for the rest of my life. I hated to read as a kid, so my goal is to write stories that take the “reluctant” out of “reluctant reader.” And finally, it’s travel. This is not only me enjoying a few quiet moments on the beach somewhere or exploring other cultures that I’ve only met on TV, but it’s the joy that I get from doing school visits or seeing a line of kids at a book fair or indie bookstore. I always enjoy that as much as the kids who come for an autograph. What is your greatest fear? Doing the amount of work that I do in vain. I’ve published maybe three dozen books on my own, and sometimes the reaction wasn’t quite what I had hoped it to be. But often, just when I was at my lowest, I’d get a note from a kid who said that he hated to read until he read one of my books, and that I should make lots more. So I do! What is the trait you most deplore in yourself? Sometimes I feel like my inner child still rules my outer adult. Which is great for writing and drawing. And sometimes during a school visit, I will get out and shoot hoops with the kids at recess or throw a football around. BUT, that also means that I still have childlike views of how others should act. Meaning if they promise something, I expect them to do it. You know how if you promise a kid to take them to the zoo, they will remind you the rest of your life? Yeah, that’s me. As a result, I’m often disappointed at how little many adults keep their promises. Which living person do you most admire? I don’t often like to talk about politics because of how divisive it is, but I would have to say former president Barack Obama. I know how difficult it’s been for me as an African-American man to break into the publishing industry, so I can only imagine what it was like for him. And through it all, he kept his dignity and class. What is your greatest extravagance? I don’t consider myself an extravagant person. I’d much rather someone take me out for ice cream and a walk in the park than an expensive gift. What is your current state of mind? Happy and anxious, “Hanxious.” It’s been more than a year since I turned in the final version of New Kid. And it took about 18 months to draw it. And before that, it took about two years to develop and write. So, as I write this, it’s about three weeks away from being released. For the longest, the only ones who I could talk to about it were my sons and my editor, so now I can finally get some fan feedback! What do you consider the most overrated virtue? My circle of friends have always thought that everything came so easily for me. So whether they thought that was luck or good fortune, or something else. But few people have realized the amount of work, sacrifice and discipline that was needed to finally get to this point of my career. On what occasion do you lie? So that I don’t hurt someone’s feelings on issues that don’t need to be rectified. Like if someone shows me a drawing or a story and asks what I think, I never say it’s wonderful if I don’t think it is. But I also will take the time to tell them how I think it can be improved. But if someone says, “Hey, wasn’t it the best time ever when this happened?” or something like that, then I might stretch the truth a little to spare them. Which words or phrases do you most overuse? I’ve tried to cut “awesome” from my vocabulary. And I probably use “please” and “thank you” a lot, but I’m not stopping that. Those words are awesome! Besides writing, which talent would you most like to have? Well I’m fortunate to have been able to write AND draw New Kid, so I won’t say either of those. I have a lot of friends who paint, which I’ve always admired. And a few actors and musicians. So… MAYBE singing. But I’d never want to do it professionally. What do you consider your greatest achievement? The number of people who come up to me (or email me) to say hi because I visited their school when they were kids, or coached their basketball team or baseball team, or took the time to draw them a picture or sign a copy of one of my books. If you were to die and come back as a person or a thing, what would it be? A duck-billed platypus. No explanation. What is your most treasured possession? My comic book collection. I have some goodies like the first appearances of Wolverine and The Silver Surfer. What do you regard as the lowest depth of misery? Having to take the time to think about the lowest depth of misery. What do you most value in your friends? Making the effort to keep the friendship alive. Too many people today feel as if hitting “like” on Facebook means you’re still keeping in touch. I don’t. Who are your favorite writers? Currently Renee Watson and Ibi Zoboi. And I’m about to start Elizabeth Acevedo’s book. Eric Velasquez on the illustration front. David Small and Gene Luen Yang for graphic novels. Who is your hero of fiction? I hope you mean a fictional character and not an author. If so, it’s Pip from Great Expectations, because that was the first book of substance I ever finished and actually enjoyed. Which historical figure do you most identify with? After reading Eric Velasquez’s book, maybe Arturo Schomburg. Especially since I’m one of the cofounders of the Schomburg’s Annual Black Comic Book Festival. It was nice to finally learn about the man whose library I spend so much time in. JERRY CRAFT is an author and illustrator who has worked on numerous picture books, graphic novels, and middle grade novels. His middle-grade graphic novel, New Kid, has received starred reviews from Publisher’s Weekly, School Library Journal, Booklist and Kirkus. 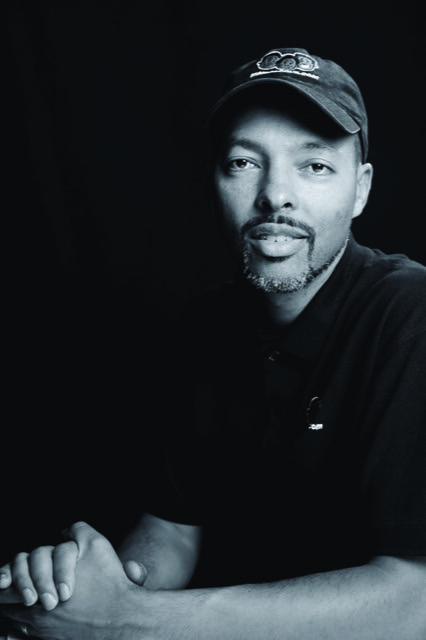 Jerry has earned recognition from the Junior Library Guild, and has won five African American Literary Awards. He is the creator of Mama’s Boyz, an award-winning comic strip that was distributed by King Features Syndicate from 1995 – 2013. Jerry is a co-founder and co-producer of the Schomburg’s Annual Black Comic Book Festival. He was born in Harlem, grew up in nearby Washington Heights, is a graduate of The Fieldston School, and received his B.F.A. from the School of Visual Arts. Find Jerry via his website, Twitter, Facebook, and Instagram.